The book's endearing characters come to life in this endearing children's hit, destined to become a children's software classic. Mitzvah Giraffe didn't always have a long neck. For that matter, his name wasn't always Mitzvah Giraffe, either. His friends used to call him Mopey because he was always moping around wherever he went. Find out how some advice from an old goat, and a bit of excitement in the forest, ended up changing both his name and his neck size! 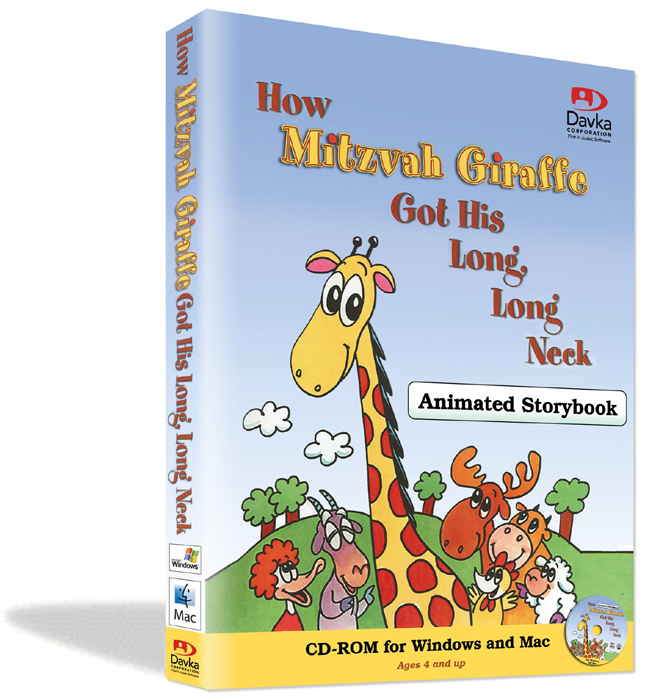 How Mitzvah Giraffe Got His Long, Long Neck includes two complete versions of the story - the computer can read the entire story aloud, with delightful animation on each page, or you can enhance your experience with the special interactive version that contains hidden, clickable surprises. Watch and listen as the story is read aloud! Enjoy hidden, clickable surprises throughout the story! Fun-filled activity section includes a printable coloring book and exciting games!